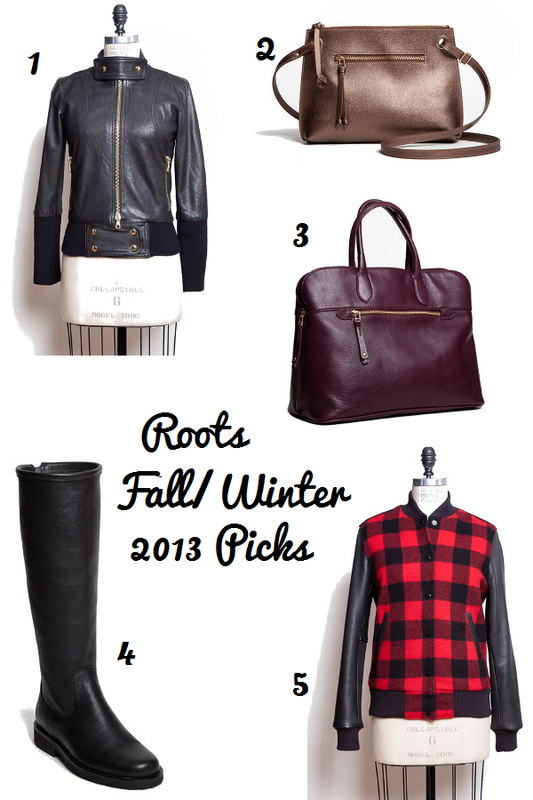 Although I've been a fan for some time, I grew to love Roots even more after attending their fall/winter 2013 media preview in June. After all, what's not to love about a Canadian heritage brand that still manufactures in Canada, using leathers sourced from the same European tanneries that supply luxury companies? Learning about the thoughtful details and construction behind each sporty, Canadiana-infused piece in the fall/winter 2013 collections proved to be somewhat overwhelming. (So much to see!) But now that I've had time to mull over the collections, definite favourites have emerged. Which of these items do you have your eye on? 1. The Smythe x Roots collaboration leather jacket ($988) is one beautiful bomber, with its gold hardware, slightly shrunken fit, and buttery soft leather. This is an investment piece that will look good for years to come. Available at select Roots stores starting September 7. 2. This season, I'm obsessed with the idea of using metallic bags to lighten up dark jackets and coats. The 'Edie' crossbody bag in gold saffiano leather ($88) would do just that; picture it with a black schoolboy blazer and cozy heather scarf. Cute, right? Keep your eyes peeled for this golden number around the holidays. 3. The 'Shirley' bag in oxblood ($398) is a nod to current colour trends, but in a timeless structured silhouette that's ideal for the office and running around town. Available August/September. 4. The 'Russian Vamp' ($328) is the quintessential flat black knee-high boot you'll want to wear all fall and winter. Available August/September. 5. It's no secret I like buffalo plaid, but what I adore about the 'Sorority' jacket ($388) is how it combines the perennially popular print with melts-to-the-touch leather sleeves and a letterman jacket look. Available August/September. Ooh, I'm loving that Sorority jacket!